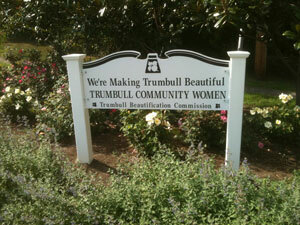 Trumbull Community Women wants you to ReLove Trumbull and ReDiscover our town. Many of us run in and out of Town Hall to pay our taxes, visit the town clerk or engineer, but did you ever notice the wonderful memorials, sculptures and other art around Town Hall and near the Library? Next time you’re at Town Hall, take a few minutes to look around. Start your “tour” before you walk into Town Hall from the Millennium Brick Walk. The brick walk features engraved commemorative bricks. Recognize any of the names? 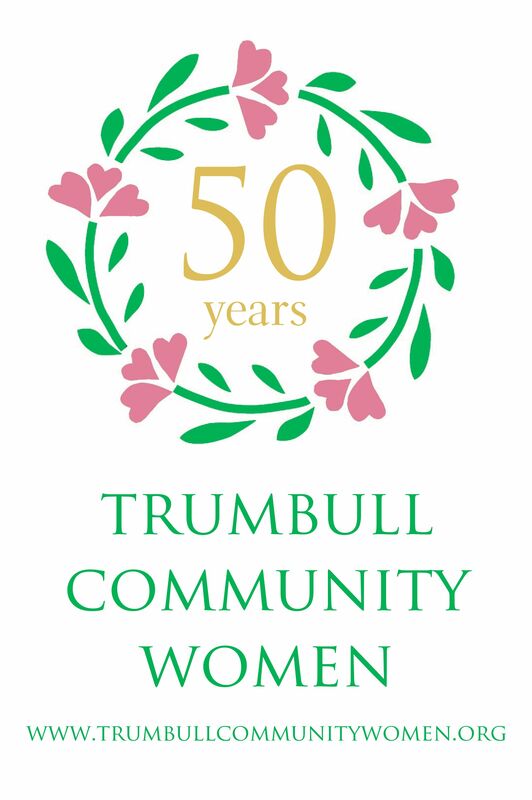 The Town seal is surrounded by scenes from Trumbull’s past and present. Look closely to see them all. The names of first selectmen are engraved on bricks encircling the Sundial garden. The seal is excellent for a pencil rubbing. But … Don’t step on the flowers! Before you enter Town Hall from the brick walk, look for this plaque. It’s located on the building, partially hidden by a hydrangea bush! Can you find it? Enter Town Hall through the brick walk. The mural on the left depicts many of Trumbull’s historic treasurers. On your right is the Art Gallery. There is an exhibit of local artists that is usually displayed for 6 weeks at a time. The art is also displayed on the 2nd & 3rd floors. On the 2nd floor of Town Hall is an exhibit of all things related to the 1989 Trumbull Little League World Champions. Dedicated in 2002, the statue of Jonathan Trumbull stands in front of Town Hall. The statue depicts Trumbull holding a bible in one hand and the Declaration of Independence in the other. Read the inscription on the plaque for more details. After visiting Jonathan’s statue, wander around the front lawn of Town Hall. There is a large granite War Memorial and a World War I memorial marker on a large boulder. Take some time to reflect and give thanks. Look under some of the trees and you’ll find memorial markers & plaques. Can you find the 1976—2076 Time Capsule marker on the front lawn? In front of the library is a sculpture in bronze by Ervin Nussbaum entitled THREE GIRLS ON A FLOWER,. The sculpture was commissioned by the Friends of the Library and was dedicated in 1976. The town’s Bicentennial Fountain is located at the corner of Quality Street and Church Hill Road. In 1997 a time capsule was laid at the base of the Bicentennial Fountain. It will be opened in October 12, 2097, Trumbull’s tri-centennial. The wall around the fountain has many memorial plaques. The fountain usually runs 24 hours a day from May until it gets too cold. The water is recycled. There are also chess/checkers tables and benches under the trees. It’s really lovely! And quite peaceful.